All clothing MUST BE free of any pet hair/dander. You can call to schedule an appointment or call to see if we are able to accept your clothing today. Drop your clothing off, we will go through and select and appraise the clothing. 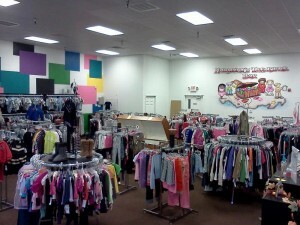 After clothing has been selected and appraised, you will receive a telephone call with an offer (cash or store credit). This process usually takes 1-3 days. All of our new clothing comes in from New York City. We personally travel to the city and hand select clothing for the store. Some brands we have available are Polo, Roca Wear, Pelle Pelle, LRG, Akademiks, Baby Phat, Apple Bottoms and many more. Not what you’re looking for? Tell us what brands and sizes you are looking for and we will do our best to get what you prefer! We will be adding an online store soon for new clothing ONLY! Be sure to check back for the online store!